A report presented to the State Government a decade before the release of the Oakden report last month warned that mental health services for older people were the most understaffed and underdeveloped in the state. Last month, the Government announced it would close the Makk and McLeay older persons’ mental health services at Oakden after Chief Psychiatrist Dr Aaron Groves’ report into the facility detailed widespread mistreatment and abuse of patients at the state-run facility over more than a decade. The Oakden report found the facility was up to 44 staff short early this year, that patients had suffered abuse and indifference at the hands of staff and that the service featured “seclusion, restraint and rough handling practices transported from mid-late 20th Century”. The “Stepping Up” Report, whose recommendations shaped sweeping Rann-era reforms of South Australia’s mental health system, was handed to the State Government in 2007, when Gail Gago was Mental Health Minister and now-Premier Jay Weatherill was Minister for Aged Care. The report also warned that a shortfall of staff in older persons’ mental health care was impacting services. “The ratio for the older people’s sector reinforces the concerns that have been expressed to the Board about shortfalls in service responses,” the report reads. “[There are] 23.8 staff per 100 000 population over 65. 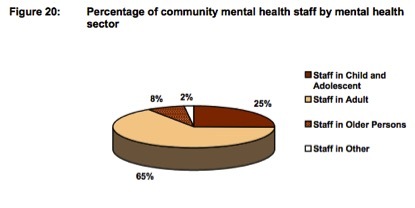 A pie chart in the 2007 Stepping Up Report shows older persons’ mental health was the most understaffed of all SA mental health services. Gago told InDaily that she could not recall how the Government responded to the understaffing issue at the time. “It’s 10 years ago, and I just can’t recall any of the detail, and I don’t cave access to files to be able to jog my memory,” she told InDaily this morning. Gago said all she could recall was that the Commonwealth Aged Care Safety and Accreditation Agency had applied sanctions to Oakden in 2007, and that a process was set up to address problems that were identified. She said she could not remember any detail about State Government action regarding the Oakden facility at the time, nor what the Government did in response to the Stepping Up Report as it related to older persons’ mental health services. Gago resigned from Cabinet early last year and will be retiring from parliament at the 2018 election. John Hill, who was Health Minister at the time, said that mental health did not come under his portfolio responsibilities, but that he had visited the facility, and that it looked “old-fashioned” – as did many SA mental health facilities at the time. Weatherill told reporters yesterday that while there may have been discussion of the Oakden in Cabinet, particularly in 2007 “when the facility didn’t received its accreditation”, no major concerns to the degree described in Groves’ report had been raised during his time in Cabinet, which he joined in 2007. He added that he did not visit Oakden during while he was aged care minister between 2004 and 2008 because it did not come under his portfolio. The Stepping Up report describes the condition of the older persons’ mental health service sector in South Australia broadly, rather than addressing specialised older persons’ mental health facilities like Oakden in detail, and advocates “joined up” service delivery including non-government providers. While the Stepping Up report’s warnings about understaffing and underdeveloped service delivery now appear prescient to conditions at Oakden, Groves criticised the report for failing to look interstate for insights into delivering mental health services for older people. “The Stepping Up Report … does not appear to have had the benefit of the considerable academic and planning expertise within NSW (but also found in Victoria, Qld, ACT and WA) and their published plans,” Groves’ report says. “This would appear to be the reason the Social Inclusion Board report did not consider these elements when developing its recommendations concerning older persons’ mental health services in SA. Specifically, Groves criticises the notion within the Stepping Up report of transferring older persons’ mental health services to the non-government sector. According Groves’ review, a “model of care” for older person’s mental health services informed by the Stepping Up report, but never implemented by SA Health, was relied upon by executives to justify rejecting repeated requests for more funding at Oakden. Groves review states that the reliance of executive mental health staff on the flawed model “contributed to the deficits now evident at the Oakden campus because of the disconnection between an unfunded aspirational document and the real-world challenges of the service, when no process to identify the resources needed to implement a new model is made”. Groves argued that a common belief among staff at Oakden that the facility was to close, and be handed to the non-government sector, also made attracting staff difficult.